A new decade and the marathon boom was beginning. Unfortunately the significance of the Scottish Marathon Championship declined from then on. Although some good runners often did compete for SAAA medals, many others preferred to try more glamorous city events in Britain or overseas – the prizes were better for a start. For example John Graham of Clyde Valley ran 2.11.47 for third place in the 1980 New York Marathon. ; and a marvellous 2.09.28 in Rotterdam 1981. The 1980 SAAA race was to be the last one similar to the 1970 Commonwealth route – a fact lamented by those who had enjoyed a fast course and the pleasure of finishing, like normal athletes, in a stadium with many spectators. In June 1980, weather conditions had considerable influence, since there was a strong following wind on the outward journey. A good group reached 5 miles together: Graham Laing, Colin Youngson, Alastair Macfarlane, Doug Gunstone, Alasdair Kean (Derby) and another Anglo-Scot Fergus Gillies (Banbury). When the fast time of 25.18 was announced, Doug Gunstone, normally a serious quiet runner, was heard to laugh aloud. The reason was that Garscube’s Tommy Wiseman, who had done well over shorter road races, was at least thirty seconds in front at this time! Sure enough, a mile later Tommy was seen sitting at the side of the road, fumbling at his brand-new shoes and muttering about blisters. After the race Tommy still claimed he should have won. On the hill after Wallyford, the group broke up. Colin Youngson surged, and then discovered that Graham Laing was far too fast for him. The young star eased away, leaving Youngson and Kean together. After the turn (Laing 66.46; Kean 67.08), tactics were brutally obvious. It was a case of battle alone into what Alastair Macfarlane recalled as ‘the strongest wind I have encountered in a marathon – unbelievably difficult to run into’; share the pace with someone; or callously ‘sit’ on a victim, waiting for signs of weakness. Graham Laing simply kept on extending his lead. Youngson sheltered from the warm, clammy wind, behind the unfortunate Kean for four miles, then sprinted off before settling down to a steady struggle over the last nine miles. Alastair Macfarlane co-operated with Doug Gunstone until 22 miles and then strode away, overtaking the faltering Gillies and Kean on the final section. The medallists were: Graham Laing (Aberdeen AAC) 2.23.03; Colin Youngson (ESH) 2.24.56; Alastair Macfarlane (Springburn) 2.27.21. Then came Kean, Gunstone and Gillies. Since the race was sponsored by a Scottish butcher, Laing won £100 worth of meat for his freezer. Not even a chop for the others, however. One of Graham Laing’s teachers at his Aberdeen Secondary School had been Graham Milne, later a 2.21 marathoner. Mr Milne helped young Laing to develop his running at school; and from 1977 onwards was an important training partner. Graham Laing was enormously talented as a runner, and made rapid progress with what looked like considerable ease. Yet his training, partly inspired by Frank Horwill and Mel Edwards, seems tough enough on paper. Sunday’s run was 16 – 20 miles with Fraser Clyne, Peter Wilson, Graham Milne and the rest of Aberdeen AAC’s strong squad; Monday was easier; Tuesday, hill repetitions or up to 16 x 400m with 30 seconds recovery; Wednesday, the club run – a ten miler which ‘sorted out the men from the boys’, followed by a pint in the pub; Thursday might be easier or an ‘up the clock’ – one minute hard, one easy, two minutes hard etc up to six minutes hard and then down again; Friday was an easy run; and on Saturday, a race or two short fast runs. On Sunday August 24th 1980, the World Veterans Marathon took place near Bellahouston, Glasgow. After an exciting tussle, Donald Macgregor won gold in 2.19.23 seventy yards in front of John Robinson of New Zealand, who had beaten him by one second in Hanover the previous year. Second and third over 45s, in 2.27 and 2.28, were those other former SAAA champions, Bill Stoddart and Alastair Wood. On September 28th, the second Aberdeen Marathon was run, incorporating what became the fashion – an international team contest. Graham Laing (Aberdeen AAC and Scotland) was a clear winner over the severely undulating course – although the weather was favourable – recording 2.19.33, in front of 1970 Commonwealth bronze medallist Don Faircloth of England (2.21.46) and Mike Critchley of England (2.23.18). The Scottish team of Graham Laing, Don Macgregor and Evan Cameron were second to the English, but defeated the Welsh and Northern Irish. The best times for Scottish marathoners in 1980 were: John Graham (2nd in Britain) 2.11.47; Jim Dingwall 2.16.07; Andy Robertson (Army) 2.18.14; Alasdair Kean 2.19.01; Jim Brown 2.19.03; Don Macgregor 2.19.23; Des Austin (Victoria Park) 2.19.30; Graham Laing and Dave Clark 2.19.33. On 29th March 1981 the first London Marathon took place. Graham Laing, at last on a fast course, ran an excellent personal best of 2.13.59 in fifth place in a field of over 7000 runners! However he decided not to defend his SAAA title. Colin Youngson had shown good form in April 1981 by running 2.18.55 in the fast Westland marathon in Maasluis, Holland. He finished fourth, defeating amongst others Evan Cameron, Graham Milne and Donald Macgregor. The 1981 SAAA Marathon, which took place on June 20th, started and finished at Meadowbank, but the course was completely new, and not as fast as the ‘Commonwealth’ one. The route was London Road, Seafield Road East, Seafield Road, Lower Granton Road; two loops round West Harbour Road, Cramond Esplanade, turn left at the Cramond Hotel, Glebe Road, Lauriston Farm Road, West Granton Road; and then right for Granton, Seafield Road, turn right up Craigentinny Avenue, and right again for the stadium. The lead was slender, only six seconds between Youngson (50.42) and Gunstone, who was running with Macgregor at ten miles. By halfway (68.36) it was eleven seconds; and by fifteen (77.06) 16 seconds, with Macfarlane another twelve seconds down, and gaining. The twenty mile point was reached in 1.44.40 by Colin Youngson, who was really feeling the mental strain of leading by so little for so long. By then the gap was up to 34 seconds – not at all a comfortable lead. So Youngson put his head down and ran flat out for three miles, to stretch away from Macgregor and Macfarlane, who had moved into third place. Colin was about a minute ahead with a couple of miles to go, but slowed down on purpose while plodding up the steep hill of Craigentinny Avenue, so that he could gain some physical and mental resilience to fight, if Donald’s famed strong finish proved a threat. At 25 miles (2.12.58), the time gap was 54 seconds. Eventually it was a relieved but exultant Colin Youngson who hung on to win in 2.20.42 from Donald Macgregor (2.21.31) and Alastair Macfarlane (2.22.25). These three were followed by Doug Gunstone (2.26.52), Evan Cameron (ESH 2.27.23), Tommy Wiseman (Victoria Park 2.27.57), Dave Lang (Elgin AAC 2.28.28), Donald Markie (Falkirk Victoria 2.29.32) Colin Martin (Dumbarton AAC 2.31.03) and Peter McGregor (Victoria Park 2.33.45). Donald Macgregor described the new route as ‘ghastly … all very low key’. He felt tired on a warm day. ‘Colin never looked like being caught and was determined to win. I can’t say it broke my heart to lose; probably I was happy to get back second. After all I was almost 42 by this time, and the renaissance of the Dundee Marathon was still around the corner, where I ran 2.17.23 and 2.18.08 in consecutive Aprils in 1983 and 1984’. Alastair Macfarlane felt the pace fast early on, but continued to work, and was delighted when Doug Gunstone dropped back after twenty miles and enabled Alastair to gain another bronze medal. Pot-hunting Youngson’s day was marred slightly because, although the event was in theory sponsored, as in 1980, by British Meat, there was no £100 worth of meat for the freezer this time – not a sausage, in fact. Many years later, having become more or less a vegetarian he was, in retrospect, relieved. However the fact that the SAAA event was no longer a marathon which attracted the very best runners was emphasised by the result of the Sandbach race on the next day. This was a triumph for Andy Robertson of Stirling, an Army runner stationed at Harrogate. He won the Cheshire event and defeated several international runners – finishing in a personal best of 2.14.23. Fourth was Graham Laing who recorded 2.15.29. Andy Robertson said that he hoped the Scottish selectors would take note of this performance, and would consider choosing him to take part in the 1982 Commonwealth Games. Sadly it was not to be, although he did gain a Scottish International vest on the track – but Andy’s Sandbach run was outstanding nevertheless. On Sunday 27th September the Aberdeen Marathon took place during a bitterly-cold gale. Max Coleby of England won in 2.21.29, a second in front of his team-mate Martin Knapp. Don Macgregor of Scotland was third (2.21.52) and cross-country international Fraser Clyne, running his first marathon, fourth in 2.23.36. The Scottish team, completed by Evan Cameron and Graham Milne, were second. 68 year old James Youngson, Colin’s dad, ran a personal best of 3.31. The Glasgow International Marathon took place on 18th October, and after a close race was won by Jim McGlynn of Eire in 2.18.24 from Alan Cole of Wales in 2.18.53. Third was Rod Stone of Stirling and Northern Ireland (2.19.08), fourth Colin Youngson of Scotland (2.19.12), fifth Des Austin (Scotland 2.19.19) and sixth Alastair Macfarlane (Scotland 2.21.01). The Scottish team won on countback. Priscilla Welch won the women’s race in 2.55.15, three minutes up on Leslie Watson, legendary for beauty and the ability to run over a hundred marathons without apparent strain. This race had only 144 runners, against Aberdeen’s 500, but Glasgow Sports Promotion Council planned 1982 to be a People’s Marathon, with 5000 entrants. The 1981 Scottish Marathon rankings were dominated by John Graham’s brilliant 2.09.28 winning time in Rotterdam. Then came Graham Laing (2.13.59); Andy Robertson (2.14.23); Jim Dingwall (2.14.54); Dave Clark (2.18.42); and Colin Youngson (2.18.55). There were fourteen sub-2.20 performances. The Commonwealth Marathon Trial was the AAA event in Gateshead on June 13th 1982. A tough, undulating course on a windy day nevertheless produced an exciting contest for Scotland’s best three marathon runners. Eventually, in the words of Alastair Macfarlane, ‘Jim Dingwall ran his best marathon for some time while having a momentous struggle with Graham Laing. Jim opened a gap of ten yards at about 23 miles but Graham held on, so much so that the pair managed to pass Ray Smedley in sight of the stadium and indeed almost caught John Graham who had been well clear but tired badly in the last few miles.’ Overall, John Graham (Clyde Valley) was fourth in 2.15.14; Jim Dingwall (Falkirk Victoria) fifth in 2.15.30; and Graham Laing (Aberdeen) sixth in 2.15.39. Lindsay Robertson (EAC) ran an excellent debut marathon in 2.19.18; and not far behind were Fraser Clyne (2.20.39) and Evan Cameron (2.22.00). The selectors chose John Graham and the improving Graham Laing. Obviously, Jim Dingwall was extremely unlucky to miss out, since he had defeated Graham in shorter cross-country and road races as well as this trial. However he realised that there had been financial constraints which prevented three marathoners being selected – and philosophised that fairness was not always to be expected in life. Certainly, Jim wished Graham Laing well – and he was to produce a good performance in Brisbane. 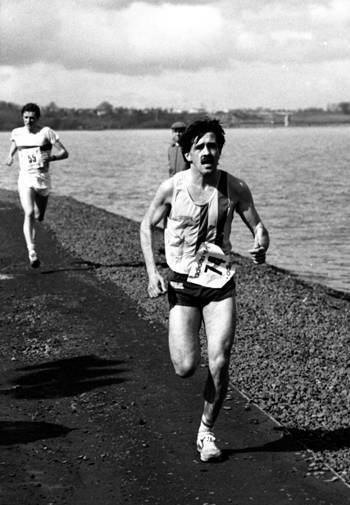 The SAAA Marathon championship, which might easily have been nominated as the Scottish Trial, took place on Saturday 10th July 1982, on an out and back course from Grangemouth stadium. A calibrated wheel was used to ensure that the correct distance was run. Only 30 competitors turned up, but they included a number of good athletes. Conditions were warm and humid. Colin Youngson had been running fast in training, including six or ten mile time-trials in his 80 miles per week. He had reduced this to 50 two weeks before the race, and had then experimented, running a fairly hard 21 on the Sunday, followed by the protein ‘diet’, a ten mile run at 7 a.m. on Monday, and a carbohydrate-packed breakfast. Thus the tough part of the regime had lasted only 20 hours! No running on Tuesday and Wednesday, a three mile ‘digestive’ jog/stride on Thursday and Friday, and off to the start. In the dressing room he encountered Jim Brown, who declared his intention of running two hours twelve minutes! Colin had great respect for his younger rival, who had defeated him easily on countless occasions over the country and in shorter road and track fixtures. It was agreed that they would share a sensibly brisk pace to ten miles, in under 52 minutes. Then Jim would make his bid. Colin started quite fast, and led for two miles. Thereafter they went to the front for one mile each, into the breeze. Five miles passed in 26.27, which seemed wrong – rather slow for the pace they seemed to be setting. At this point Sandy Keith completed the trio. By ten miles, on target in 51.49, the watch indicated a speed-up but the tempo had in fact remained much the same, although Sandy had slipped back to 53.00 and was running with Craig Ross, a 2.21 man. For the next three miles to the turn, Youngson simply sheltered behind Brown and waited for him to surge away. Nothing happened. Half-way was reached in 67.21; with Ross 69.10; Keith 69.32; Peter Wilson and Gerry Fairley (Kilbarchan) 71.40. At the front, nothing continued to happen, and the breeze was now helping progress. Fifteen miles (78.11) saw the duo 2.16 in front of Ross. Gaining in confidence due to the steady, fairly comfortable pace, and feeling that, although it was hard to imagine Jim Brown beatable, he ought to be tested, at least, Colin Youngson prepared to try. As his stop-watch reached 1.30, he moved to the middle of the road and ran absolutely flat out for the next half mile. A look behind revealed a fifty yard gap! Another hard half mile – and there was no one in sight! Jim Brown, perhaps feeling that his target time was unattainable, had dropped out. An unsympathetic but delighted Youngson later wrote in his diary ‘Bashed on slightly less hard’. 20 miles took 1.45.14; Ross 1.50.24; Keith 1.50.38; Wilson 1.51.56; John Lamont (also Aberdeen AAC) 1.52.47. Craig Ross had to stop shortly afterwards. The last two miles felt tough to Youngson, since he was striving to beat 2.20, and could see neither the stadium nor a race steward to point the way. However both appeared, and as Colin panted up to the entrance, there was Jim Dingwall leaning against the wall. Jim glanced at a stopwatch and said, ‘Still only 2.16 – should get a decent time if you hurry.’ So there was no steady lap of the track, waving modestly – just a red-faced maximum effort, which resulted in a narrow failure to break 2.18. Still, it was Colin Youngson’s second-fastest time (2.18.02), and one of the bigger winning margins. 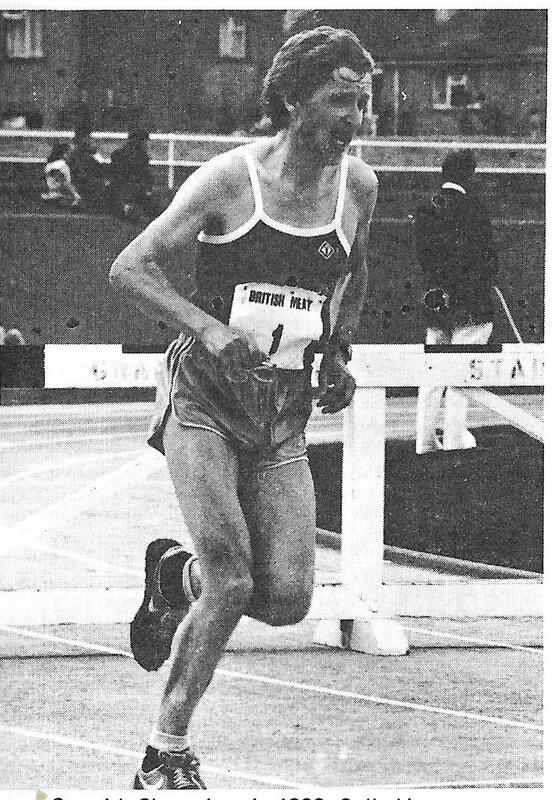 Second was Sandy Keith (EAC – 2.26.34); third Peter Wilson (Aberdeen AAC – 2.27.01; fourth John Lamont (Aberdeen AAC – 2.28.59); and fifth Andy Stirling (Bo’ness – 2.30.17). Another good Aberdeen performance – even Sandy Keith used to be a club member. The 12th Commonwealth Games in Brisbane, Australia featured the marathon, which took place on the second-last day, October 8th 1982. Graham Laing remembered the weather as warm but not roasting, since this was near the beginning of the summer season. During the acclimatisation period, Graham Laing remembers socialising with Nat Muir, Allister Hutton, John Robson and the inimitable, wise-cracking John Graham, who set a ferocious pace during training runs. The actual race started at 6 a.m., before the heat built up, and it seemed strange to complete a marathon before breakfast. Obviously someone had learned from the cautionary tale of the 1954 Commonwealth event. The holder, Gidamis Shahanga, and his Tanzanian team-mate, Juma Ikangaa, started very fast, and maintained the lead until Ikangaa broke away. Rob De Castella of Australia led a group comprising John Graham and Graham Laing of Scotland plus Kevin Ryan of New Zealand. They passed ten miles in 49.06, and half way in 64.10 (forty seconds down on the Tanzanians). After 25 k ‘Deek’, who was very strong over the Queensland University hills, started to come through, to a narrow victory over Ikangaa, with the Scottish duo performing very well to secure fourth and seventh places. Unfortunately it had to be an Englishman, Mike Gratton, who passed John Graham in the last two miles. With Jim Dingwall running, Scotland could have won the ‘team race’! The result was: first Rob De Castella (2.09.18); second Juma Ikangaa (2.09.30); third Mike Gratton (2.12.06); fourth John Graham (2.13.04); fifth Kevin Ryan (2.13.42); sixth Gidamis Shahanga (2.14.25); seventh Graham Laing (2.14,54); and eighth Ian Ray (England – 2.15.11). Previously, on September 19th, the Aberdeen Marathon had provided a much less illustrious Home Countries international match. After Fraser Clyne and Colin Youngson ran too fast for the first ten miles (50.37), both tired, while Gerry Helme of England (later a 2.10 performer in London) finished powerfully over a new course to record 2.15.16. Second was Ieuan Ellis from Wales (2.16.47); third Fraser Clyne (Scotland – 2.19.58); and fourth Colin Youngson (Scotland – 2.21.03). The Scottish team, completed by Peter Wilson (2.26.20) beat England but just lost to Wales. The event included the first-ever Scottish Women’s Marathon Championship, and the Welsh runner Jacquie Hulbert (Les Croupiers) won in 2.52.20; from Lynda Stott (Aberdeen AAC – 2.53.04); and Priscilla Welch (Shetland – 2.55.59). A race of considerable importance was, on 17th October, the first Scottish People’s Marathon in Glasgow. 7000 competitors started from Glasgow Green – and most managed to finish there too – including ‘elite athletes’ like Ian McLauchlan of Rugby fame and Madge Sharples, supervet-jogger. Appropriately the race was sponsored – and perhaps fuelled – by Scott’s Porage Oats. A crowd of more than 100,000 cheered and waved. Glenn Forster of England won in 2.17.16; second was Colin Bark (England – 2.18.36); third 21 year-old Peter Fleming (Scotland – 2.19.40); and fourth Jim Brown (Scotland – 2.20.38). Priscilla Welch from Shetland won the Women’s race. 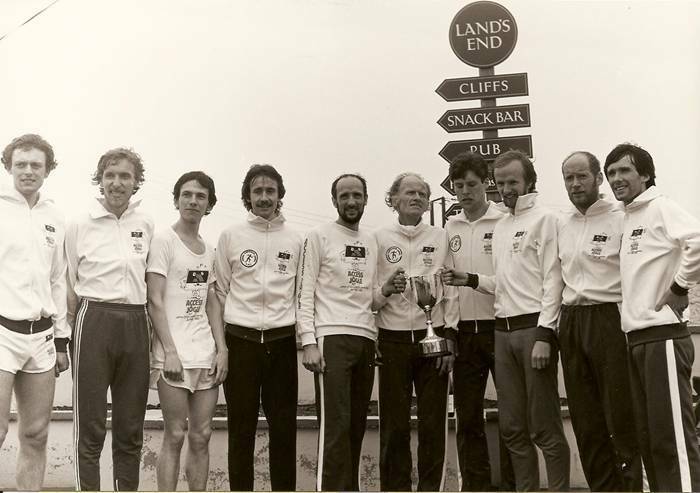 The 1982 Scottish Marathon lists were headed by John Graham (2.13.04); followed by Graham Laing (2.14.54); Dave Clark (2.15.28); Jim Dingwall (215.30); Andy Robertson (2.17.06); Colin Youngson (2.18.02); Lindsay Robertson (2.19.16); Peter Fleming (2.19.40); and Fraser Clyne (2.19.58). There were 18 performances sub 2.20. The fast Westland Marathon in Maasluis, Holland, was a regular venue for Scottish runners at this time. Excellent hospitality, a fast flat course, two sets of pacers (one set to 20k and another to 25k) to ‘hide behind’ if there was a headwind, and generous prizes – these were the attractions. Colin Youngson made his third trip there and was rewarded with sixth place and 2.17.33 on 2nd April 1983. Sunday 17th April 1983 was the date for the London Marathon and a lifetime best for Jim Dingwall, who sprinted all the way to record 2.11.44. This single race added many names to the Scottish All-time list and dominated the 1983 rankings: Graham Laing 2.14.20; Fraser Clyne 2.14.29; Dave Clark 2.16.06; Andy Girling 2.16.44; Alasdair Kean 2.16.51; Lindsay Robertson 2.17.02; Paul Kenney 2.19.04; Andy Robertson 2.19.09; Donald Ritchie (at last!) 2.19.35; Peter Wilson 2.20.05; Evan Cameron 2.20.33; George Reynolds 2.20.41; and Graham Milne 2.21.27. The first City of Dundee People’s Health Marathon took place on 24th April 1983. Don Macgregor seemed reborn, winning as he pleased in his fastest time since becoming a veteran – 2.17.24. Vast crowds and excellent organisation made sure that the event would continue. Macgregor’s training partner, Terry Mitchell (also representing Fife AC) was second in 2.20.50; Rab Heron came back from Brighton to his home area, recording 2.21.26; and there were other good runs from Craig Ross (Aberdeen – 2.22.43); Murray McNaught (Fife – 2.23.34); Sam or Ian Graves (Fife – 2.23.57); and Charlie Haskett (Dundee Hawkhill H – 2.26.31).